Mali travel is a historical sojourn across the country's esoteric landscape, dotted with numerous cultural and historical sites. Every year thousands of tourists travel to Mali to experience the beauty and charm of this country. Mali travel has a lot to offer in terms or leisure and recreational activities. The cities in Mali are enchanting and evoke an old world charm. Timbuktu, perched on the southern most tip of the rigorous Sahara desert is an ancient city. It is famous for the University of Sankore, which is the seat of Islamic learning. The city of Gao till today shows traits of the cultural legacy of the Songhai empire. Mopti is the center of tourist attractions. Timbuktu and Pays Dogon have been declared World Heritage Sites by UNESCO. The different World Heritage Sites, National Parks and culturally and historically significant places are the chief attractions in Mali tourism. Mali tour and vacation allow the traveler to explore the country through different perspectives. 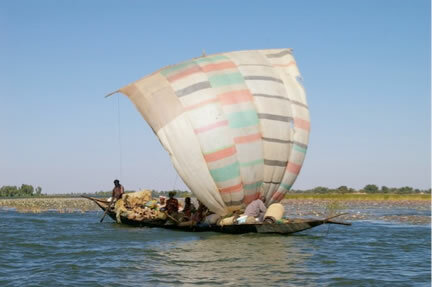 The boating tours along the Niger River offer a quick glimpse of the beautiful countryside. Hiking tours offer ample opportunity to rediscover the Dog on country. Tours on camel caravan across the Sahara desert is a wonderful experience. Tourists can travel to Mali by air, land or water. Flight is the most convenient and easy way of reaching Mali. Most of the European aviation majors have flights to different airports in Mali. Gao International Airport receives several international and domestic flights. Senou International Airport, Kayes Airport and Mopti Airport receive flights from major destinations of the world. Since Mali is a landlocked country, the only way to Mali by road is through Algeria. Road journey is viable for short sight seeing trips. Ferries along the river Niger link various cities in Mali. The best time for traveling to Mali is between November and January. Mali hotels assure a pleasant and a hassle free stay to the travelers. Various types of hotel can be found in Mali and they offer different category of rooms, according the individual tastes and needs of the traveler. Mali hotels offer excellent amenities. Numerous luxury hotels, budget hotels and bed and breakfast hotels are available in cities like Bamako, Mopti and Gao. Mali culture tours provide tourists an opportunity to take a closer look into the tradition and culture of the beautiful country of Mali. Mali is one of the largest West African countries where the majority of population belongs to the Muslim community. Mali culture forms an integral part of the nation. The rich culture of the country is visible in its people, artworks, architectural constructions and all. Diverse forms of culture can also be observed in food and music of Mali. Cultural tours in Mali include the religion, language and festivals of the region. Mali is a perfect tourism destination for the tourists looking for an adventurous and exciting vacation. Mali is blessed with the fabulous mosque, fishing port, bustling market and the traditional colorful festivals. The desert festivals of Mali draw huge number of tourists from all over the world. While on a cultural tour to Mali the tourists get to gather information about the country's religious customs. As the country of Mali is home to diverse ethnic tribal group, the cultural activities of Mali vary accordingly. The largest tribe that occupies Mali is the Bambara. The Dogons and Tuareg also practice their individual traditional way of life. Mali cultural tours take tourists to the villages and towns inhabited by these tribal communities. It includes trips to the unique Dogon villages clustered in and around the Bandigara escarpment. The Niger River, Mopti and Djenne are also covered by the cultural tour of Mali. Mali Eco tours and vacations are among the popular tours in Africa. These tours help the tourists to experience the surreal landscape of the country. Eco tourism in Mali allows the tourists to explore the natural regions of the country. It also enables the travelers to enjoy the picturesque beauty of Mali. Mopti - It is one of the popular sites of Mali. Tourists willing to make a trip to Mopti can visit the town between August and November. During this time, Mopti experiences a pleasant weather. Bandiagara Escarpment - Bandiagara Escarpment is situated near Dogon and is one of the popular destinations for trekking in the country. It is a sandstone ridge that rises about 1,000 feet above the adjoining areas. Segou - Segou is known to be a greener and colonial version of Djenne. It is located about 200 kilometers from Bamako. Djenne - Djenne is one of the important tourist sites in Mali. It is known to house beautiful mud architecture and mud mosques. It is also famous for its Monday market. On the junction of Black Africa and North Africa, Mali is a vast territory where the majority of the population kept the ancestral way of life of the nomads, the peasants or the fishermen. Its history goes back to highest antiquity and it was the cradle of several great medieval empires of Western Africa whose fame of wealth related to gold caused many covetousness's. Since, this country was done discrete but still has in its centre a priceless wealth: the Plateau of Bandiagara. By its geological, archaeological, ethnological characteristics and its exceptional cliff landscapes, it is one of the most imposing sites of West Africa. Indeed, it shelters very beautiful architectures (dwellings, altar stones, sanctuaries and men shelters called Togunas) and has prestigious social traditions still alive (masks, ritual and popular festivals, worships to the ancestors through several ceremonies) perpetuated through the centuries by Dogons one of the most astonishing people of all Africa. Cut off since from the centuries to the chaotic universe of cliffs of Bandiagara as in a fortress, they knew to safeguard their culture which is deeply influenced by a single cosmogony. Superb landscapes, villages with animated and colorful markets, majestuous mud-made mosques. The River Niger, this attractive river, a casting of similar life in the Nile which traverses the country liberally and comes to be lost in an interior delta, by giving life to the arid grounds. The legendary cities of Timbuktu and Djenne, but also cities and areas less known but not less interesting. With this trip, we invite you to go to discover Mali, this country whose human wealth does not find its similar elsewhere! Bamako: "Bamako is a Bambara word meaning "Crocodiles River". In 1806 Bamako was a Bozo fishing and trading community of about 6000 people. In 1883, the French captured the town and in 1908 Bamako became their regional seat of power and they built their residence on the hill of Koulouba. At the independence in 1960, Bamako was chosen as the capital." Essakane: Created in January 2001, the "festival au desert" is held every year in Essakane, two hours from Timbuktu in Mali. This Festival seeks its origin in the big traditional Tuareg festivities, as Takoubelt in Kidal and Temakannit in Timbuktu, which represented for long time a place for decision making and exchange of information among the different communities. At the beginning, there were songs and Tuareg dances, poetries, camel rides, games, etc. Today, the Festival is opened to the external world and welcomes artists from other Malian regions, other African countries, but also from Europe and from the whole world. During three days, around 30 artistic groups are invited from all around the world to present their art. Due to the attention of the media and to the huge logistic effort that it is mobilizing, the Festival is now included among the Big Modern Festivals, though it maintains its traditional cultural aspects. NEW YORK, NY - The United Nations and the European Union have forged an agreement today to fund the restoration of cultural heritage in Timbuktu that was destroyed by extremists after fighting broke out in 2012 between Malian government forces and Tuareg rebels. Timbuktu was an economic, intellectual and spiritual capital and a center for the propagation of Islam throughout Africa during the city's golden age in the 15th and 16th centuries. �The agreement signed today shows that we are on track,� she stated in a news release. �Two mausoleums have now been rebuilt and this new agreement comes at an opportune moment to speed up work underway and ensure that the people of Mali can reclaim heritage that is essential to their identity and that can contribute to reconciliation. �This is vital for Mali and is important for the rest of the world because World Heritage is common to us all,� she said. Fourteen of the 16 mausoleums of Timbuktu inscribed on UNESCO's World Heritage List were destroyed by armed groups during the conflict. The manuscripts of Mali constitute a unique documentary collection that bears testimony to the history of Africa and of humanity as a whole. Mariama, the manager and owner of West Africa tours (www.touringmali.com) is a native of Timbuktu. For more than 15 years, as a founder and owner, she has been managing the first female-owned travel agency in Mali which brought hundreds of foreign visitors to the ageless lands of Mali and the Sahara. Mariama's expertise in promoting and conducting unique journeys to Mali and to other parts of West Africa is well-established in Europe and the American continent. Her dedication and commitment to quality travels combined with a profound respect for diversity made her one of the early promoters of the Essakane desert festival. Mariama is a an active member of the International Board of Directors of the US- based Africa Travel Association (ATA). Our team of experienced personnel pay particular attention to your requirements in Mali and will make you feel at home away from home. Welcome to our World!